Cheeseburger Hand Pies Recipe - Burger is another popular food that is not only a fastfood but also you can make it in home food. People who love to make cheese burger at home should follow this simple recipe step by step how to cook cheeseburger. Cook down onions until translucent. Add meat, 1 teaspoon salt, and ½ teaspoon pepper, and cook until meat is fully cooked. Transfer into a large bowl. Combine ketchup, mustard, Worcestershire sauce, and 1 teaspoon of salt, and mix thoroughly. Roll out the pie crust and cut into 4 pieces. Place a spoonful of the stuffing on one side of the dough, leaving ¼ inch from the edge and fold over, creating a triangle. With a fork, crimp down the 2 sides so the stuffing stays in. Transfer onto baking sheet. Brush on egg and sprinkle on sesame seeds. Bake for 20 minutes or until golden brown and pie crust is thoroughly cooked. 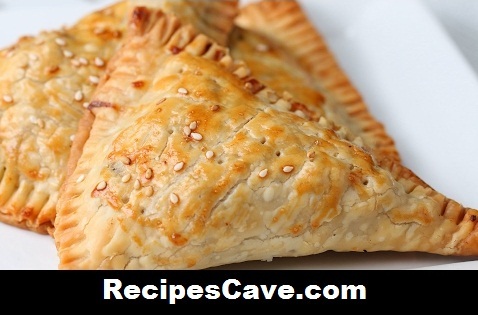 your Cheeseburger Hand Pies Recipe is ready to taste.